After having dinner at our friends’ house on Thursday, Chinese food on Friday, and driving to Utah on Saturday, it is time to get back to cooking! We are spending two weeks in beautiful Utah red rock country. Our son is here for the first week and then we are going solo for the second. What better way to start off his visit than to make his favorite meal, meatballs and gravy over noodles with green beans! This week we are doing a different world cuisine each night. Sunday’s dinner was plain ol’ ‘Merican. Tomorrow’s will be Mexican. Dining “lite” is a little harder when you want to please a loved one. I think the best thing to do will be to shrink portion size. 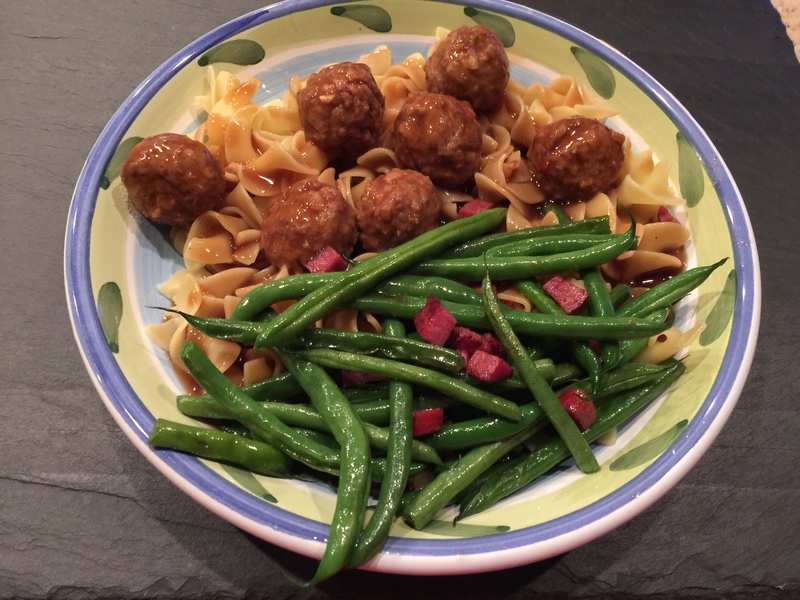 This entry was posted in Beef, Pasta, Vegetables and tagged gravy, green beans, meatballs, noodles. Bookmark the permalink.